I am now attached to the surgical team spending a decent chunk of my time helping to patch up the consequences of road traffic accidents (RTA’s) which have left parts of the anatomy sticking in all directions they shouldn’t be. I guess the unfortunate part is now every time I hop in to a packed matatu I spend my trip day dreaming about the sort of injuries I would likely sustain if we crashed in the various contorted positions I find myself. On the brighter side, I have also been involved in some amazing cases and have really been able to get my hands dirty so to speak. Natalie prepares for a new day with the surgical team. I will start by introducing John, because I loved this story and he is an integral part of the surgical ward. This is not John’s real name but no one knows what it is for sure as John doesn’t speak. 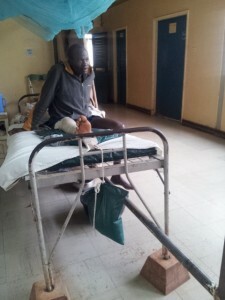 He arrived to Siaya hospital enough cycles of employees ago for no one to know exactly how long he has be here. He is an orphan, presumably brought in due to his epilepsy. He has significant developmental delay and is mute but communicates when he wishes to in his own funny way. John has been declared by a past superintendent as a permanent patient and is not charged for his stay. You hardly notice him, he quietly goes about his business and the staff have come to appreciate John and the little things he does around the place. He is the light warden, collects water for patients daily wash and helps those needing assistance around the ward. He occasionally switches different beds for a change of scenery but John always has a permanent place and other patients have to fit in around him if the ward becomes full. Every once and a while he disappears, no one knows where to, but he always returns. It maybe after a few days, it may be after a month. 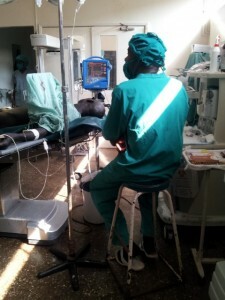 Siaya has basically one surgical theatre with two surgical beds, separated by a sheet. As I mentioned in my last blog, Siaya only has one resident surgeon, other surgeons are called in from other hospitals around the area. The team I am with call themselves the general surgery team, and they certainly are in the absolute widest meaning of the term. ‘Simpler’ surgeries are performed by the medical officers. They consider it integral new grads in the very least know how to perform c-sections and deal with ruptured ectopics. Most know how to do hernia repairs too, a common surgery here. Medical officers and Medical officer interns (equivalent of me) perform the hernia repairs, c-sections, appendectomies, debridements, amputations and explorative laparotomies which are required quite frequently following RTA’s (surprise!). A patient undergoing a hernia repair. His hospital robe is used as a screen. If a consultant surgeon is available they book larger surgeries including prostate removals, hysterectomies and orthopaedic procedures. Big cases such as patients requiring neuro or cardiac surgeries for example are referred to Kisumu Hospital who have more facilities, man power, an ICU and the CT scanner. The surgical theatre is certainly an experience. You scrub using household soap and someone holds a jug of water for you to wash it off. The taps in the wash bay currently don’t work. Again all the drapes are the machine washed re-usable type and as can be seen in the photo, the patient’s hospital robe forms the barrier which prevents them from seeing the process unfold. 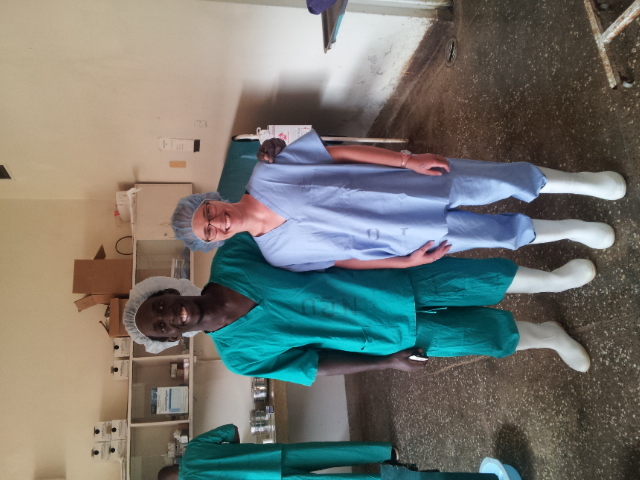 They have two advanced trainee clinical officers trained to administer anesthesia at Siaya Hospital. It is an exceedingly tough job as only one is rostered at a time and they are required to move between the two operating tables, attending to one then the other patient. They perform a lot of surgeries using spinal anesthesia including amputations, ruptured ectopics and hernia repairs. Perhaps my most important moment in theatre was after a spinal anesthesia for a cesarean section went too high affecting the patients ability to breath. Her blood oxygen saturation reached 53% and was well below optimum levels for what felt like an age before the endotracheal tube was in position. When they woke her up, as a quick assessment for hypoxic injury to the brain they pointed to me and asked who I was. The weak reply “mzungu’ (white person) was met with a lot of laughter and I must say much relief. I have never been so pleased to be called mzungu in my life. A large RTA involving a head on with a Matatu and truck spoiled many families weekend and kept the surgical and theatre teams busy towards the end of the week. There were many fractures, some compound, head injuries and one patient ruptured his intestine. There was no consultant in the hospital so the most senior medical officer opened him up, sucked 2L of blood from his abdomen and repaired the intestine. This is apparently a fairly uncommon injury with the spleen and liver more commonly ruptured in these sorts of scenarios. RTA injury patients definitely form the bulk of our ward work too. The picture is of a ‘typical’ patient who is towards the end of his stay here. This man is in skin traction, a common treatment method for broken limbs. A sand filled bag with 10% of the patient’s body weight is used to pull on the broken limb in attempt to reduce, realign and provide some pain relief. The patients remain in hospital like this for 6-8 weeks, then the limb is put in plaster, the patient is mobilized and sent home. As you can imagine the outcomes are poor with huge deformity, shortening and pain. The doctors despise this method of treatment. Unfortunately, unless the patient has the money to pay for surgery this is the only option, regardless of how many pieces the bone is in. I assisted in my very first limb amputation of a patients lower leg which had been eaten to the bone by a rampant infection. The patient had been in throbbing pain for a long time and there was no option but to amputate. This was performed under spinal and as soon as this was in place the patient was snoring, fast asleep and remained so for the whole procedure. Probably the first time he has been pain free in days and able to stack some z’s, even if it was only for an hour. Although we could provide some pain free bliss for a few hours it is unlikely the amputation has totally fixed this problem. There will be phantom pains to battle with and it is possible the infection has moved higher than the area amputated. 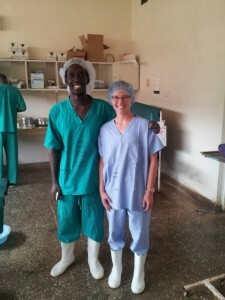 The realities of working in an under resourced hospital constantly reveal themselves here, but it is taken in good humor with “only in Africa” being quoted a few times by the nurses and doctors. I am certainly pleased I brought some disposable gloves with me. They are a nightmare to track down on the wards and are kept under close guard along with the hand sanitizer. 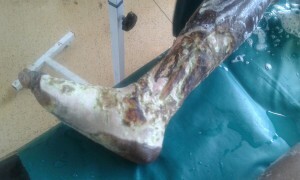 A lower leg in bad shape due to massive infection. It was amputated. Nothing is wasted as the patient has to pay before any medication or procedure is performed. Inpatients are allowed to have a ‘tab’ which they pay on the way out. Because everything is brought by the patients, blood collection needles and syringes are re-used until a vein is successfully struck. Patients must buy their own catheters, colostomy bags, dressings, IV fluids, needles and syringes, surgical gloves, scalpels, medications, you name it, they must pay for it. The hospital often runs out of dressing packs, medications and other supplys, so patients must source what they need from private dispensaries in the community and bring it back to the hospital to be administered. The abbreviation o/s or ‘out of stock’ is a common sight on the treatment sheets. The same applies in the surgical theatre. Hernia repair mesh that isn’t required is put back in to the (previously) sterile pack for use on the next patient. Another resource saving technique is draining blood lost into the patients abdomen then immediately using it to provide a blood transfusion during their surgery. I think this is a fantastic idea, if it can be done. Firstly it is safer than using donated blood, doesn’t require a sample to be sent for a cross match and reduces the need to use the very limited blood bank supplies available at the hospital. The doctors and nurses are well practiced at being flexible and dealing with situations where things don’t go quite to plan. I have rarely seen an eye brow rise when something doesn’t work or is out of stock. As one Doc said, he always learns to do things “worse case scenario, using old school methods”. Although it is the norm here, operating under these conditions is not easy. It adds a lot of extra work running invoices to the accounting department for the doctors and nurses. It also adds extra stress for families and patients trying to source their required treatment and constantly having to consider what care can be afforded. Tea fields in Kericho, Kenya. This weekend I ventured to Kericho which requires crossing from the northern to the southern hemisphere. If you blink you will miss the equator. It is marked by a small globe shaped sign with equator written on it, but I enjoyed knowing I was at the center of the world for a split second anyway. Kericho is home to some of the best runners in the world. The runners mostly arise from the Kalenjin and Kipsigis people who have been blessed with ridiculously long limbs that mean they can cover a lot of ground very quickly. Apparently to run fast the secret is Mursik or milk, consumed at dawn, mid morning and four o’clock. Like a quick fix diet I gave it a try. I still look like a lolloping hippopotamus moving down the road so I have concluded genetics plays a pretty large role in their running talent to. Despite that disappointment, I thoroughly enjoyed visiting the tea fields which stretch as far as the eye can see in all directions. It is a very beautiful sight and you are free to wander through the rows of tea in some places. 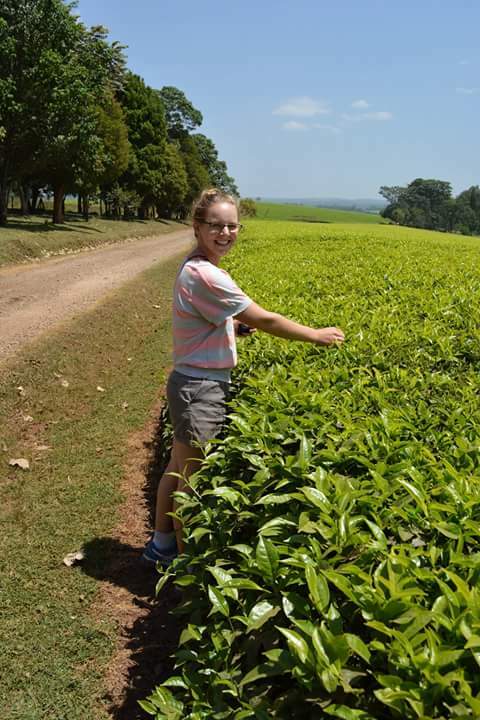 Kericho is home to 16 of the 60 tea factories in Kenya and offers a huge amount of employment in the area. Getting in to a factory to see the tea making process is surprisingly hard as they all want a written application to the manager in fear you are trying to steal their processing secrets. But I managed to find a tour in a small factory serving 8,000 tea farmers in the area. It is an incredible process and now I will fully appreciate every cup I drink knowing how much goes in to getting it to that point. Very little of the process is wasted with by products being used for lipstick, shoe polish and ceiling material.